After the first two episodes of Throwback : Balik Kampong was aired, we found that we received the most comments and questions during the show itself, and the day immediately after. But it did not stop there. Comments would continue to trickle in during the week. We realised that this is because, due to the 9.30pm Sunday timeslot allocated for the show, lots of school going kids would be in bed by then. Many of our friends would either be unable to watch, as they are putting their kids to bed, or they would be watching alone without their kids. Then during the week, they would show their children the episode over Toggle.sg, or watch the embedded vids on this blog. Some friends even told us that it has become a multi-generation affair to watch the show together, so that the older folks can reminisce and talk about their own experiences to their grandchildren. We hardly received any comments or questions about Episode 3 of Throwback: Balik Kampong. We know why. Barely hours after the episode was aired, our first prime minister Mr Lee Kuan Yew had passed away. This post-episode blog post, which is usually written and goes on the blog on Monday, didn't even start getting written till Thursday. I did write this post in tribute to Mr Lee, though. Suddenly, I was seeing our kampong experience in a new light. Kids, playing together, regardless of race, language or religion. The Azimullahs were terrified of the cats. The Tans were curious. And the Awads were fearless - and very helpful in gently removing the cats from the vicinity of Farzana. What you see on tv is far removed for you. But it was something my family experienced intimately for we really lived there for weeks. It is a real kampong with real villagers there. We even know the village couple who stays in the Tan Family hut that the production house rented the hut from. The couple had to move out of the house for the few weeks when we were there for the stay and shoot. To make the kampong circa 1960s Singapore kampong style, the production crew had to remove certain conveniences that the 2015 kampong had, like halogen lamp lighting and television sets, and they blocked off the entire back part of the house where the toilets and the kitchen (and gas cookers!) were so that we had no access to those. But, being there and mingling with the real villagers, our neighbours... we realised that the "piped water" to their kitchen and toilet and shower was piped in by generator, from the well! Suddenly we understood why many of the villagers still bathed by the well despite having a shower stall in their home - there wasn't much difference! It was the same well water, and they probably saved electricity for not having to pump the water in. Halogen bulbs hung naked from the ceiling, without even a simple light fitting covering it. A few of them had standing fans, ceiling fans didn't exist, much less air-conditioner units. The walls of the huts were usually bare cement, the zinc plate roof, the floor bare cement. Admittedly, it is better than the "dumbed down" house we stayed in that you see on TV - that was meant to be circa 1965. But what we saw there, was a real 2015 kampong! With the level of technology and know-how available in 2015, there were still many people in that country living in a kampong like that! It just really drove home how far Singapore has come since 1965 in raising the standard of living across the board for all Singaporeans. How sobering. For many people, Episode 2 was the emo-episode. Yet, this blog post for Episode 3 is even more emo! Anyway, here's Episode 3 Throwback: Balik Kampong - it's a light-hearted episode, have fun watching! Watch at Toggle.sg if the video below does not play. Rose Syrup - yes, we really drank the rose syrup that was made, as seen on the show. Of course, we made sure to drain out the solution to take away the rose petals. The solution was really fragrant and furthermore, it was the first sweet drink we have had in a few days now, at the kampong, so the kids really relished it. It was really such a treat, a luxury! I never knew rose syrup was literally made from roses, so that was an eye-opener for me. It's also good to know that you can control the sweetness of your drink by simply changing the amount of sugar you put in to boil, or by adding more water to dilute it. 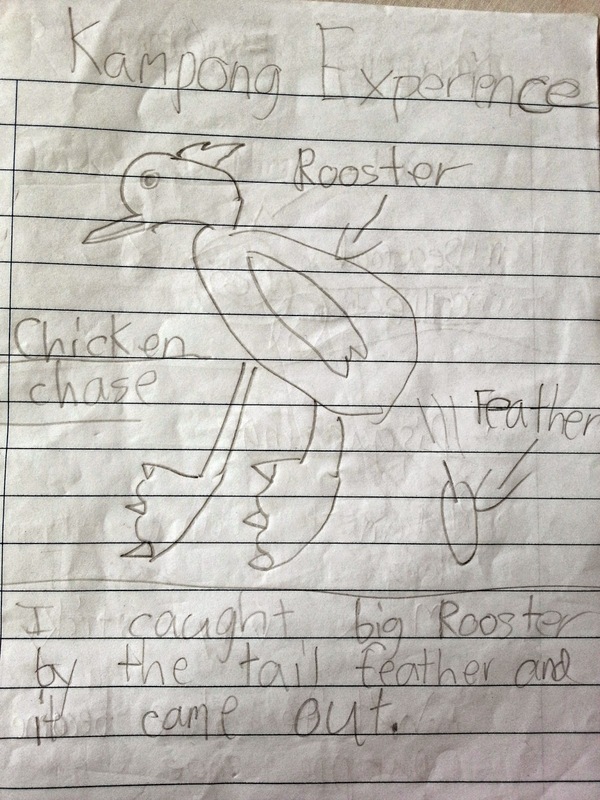 Isaac's drawing of his kampong experience catching a rooster. Chicken Chase - This was the one activity we, the Tan Family, went into feeling a bit apprehensive, but ended up enjoying it tremendously. All of us were a bit nervous about it, as we have not done it before. We were also afraid that the chickens would peck us when we tried to catch them. The kampong men told us that the part of the chicken to catch hold of, was their legs. Any one leg will do. We watched attentively as Mr Yeo the kampong expert showed us how to set the chicken trap with the basket propped up. But when we were all ushered into the huge coop with the many chickens, three broken baskets and given only 10 minutes to catch them all - we knew we couldn't go with Mr Yeo's method of setting a trap. One had to be patient with traps, for you are trying to catch the chicken unawares as they wonder toward the basket looking to eat the corn you scattered within. But the chickens we were trying to catch is certainly not going to be in the mood to eat corn, what with 8 children and 5 adults running around, chasing them?! So initially, we three mums were trying to fix the baskets. But there wasn't a lot of material we could work with. Also, I was itching to join in the action to start chasing and try my hand at catching chickens. When Hannah (Awad family daughter) came running with her first chicken caught, we gave up mending the baskets. We had a sudden brainwave and put one basket on top of another, and asked Hannah to throw the chicken in through the hole - the part we couldn't mend. Farzana (Azimullah family mum) then stepped forth to hold the baskets together so that the chickens wouldn't fly out. Mag (Awad family mum) and I quickly ran off to help the rest catch chickens. The three families initially discussed and decided that we would get the kids to chase the chickens into a corner of the coop, then the adults catch them. But once we went into the coop, it was mayhem! Everyone just ran everywhere, chasing the chickens. Hannah was excellent at catching the chickens gently, she would hold their bodies with her hands instead of just grabbing the legs like the kampong men taught us. Awad put his goal-keeping skills to good use lunging for the chickens like a pro. Matthew caught some and passed the chickens to the kids so that they can have the experience of holding the chicken by their legs. Isaac managed to catch a couple of chickens on his own. Even Farzana managed to catch a chicken - by throwing a basket on top of one! Speaking of which, I think it was great that the Azimullah gals, despite their fear of the chickens, were game enough to go into the coop with us and helped chase the chickens into a corner so that someone could catch them. Farzana especially, was so terrified, but yet she held on to the baskets firmly, and did her part to make sure that the chickens we caught did not escape. I think it is truly a milestone for her to even be in the kampong despite her phobia of cats, and moving, live chickens! I guess she explained it best when she said "We are not really animal lovers." 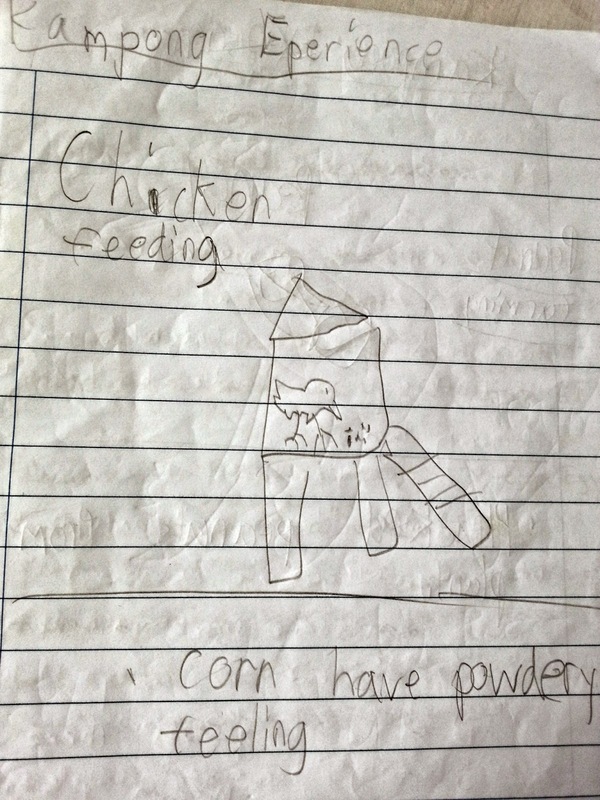 Isaac's illustration of the tiny chicken coop where the kids went to feed corn to the chickens. Communal Dinner - It was really wonderful of Mag to volunteer to host dinner and be the main cook for our dinner that night. I have hardly any cooking experience, so I was very relieved to know that Mag and Farzana had more cooking experience - this made our communal dinners a lot more delicious that the ones Matthew and I had to cook on our own. I was very happy to just take instructions from both Mag and Farzana as they guided me with chopping ingredients and preparation of the meat etc. It was a very satisfying experience to cook alongside the both of them, with the men helping out too! We have all come to love hanging out at the Awad's house as it is more airy and bright and had more open space for the kids to play. The Azimullah's house, and our house both had internal kitchens, and our front yards were along main thoroughfares of the village, and so was not as spacious a place for the kids to run around and play in. But still, it was very generous of Mag to invite us to their place for the communal dinner since she would need to clean up after we leave. We made sure to have the kids all chip in to wash the dishes and pots before we left, of course. Just that, it was bound to get sandy and all, when you have so many people there. Farzana was obviously relieved she didn't have to climb the tree too. It wasn't easy for her to be the only adult in her family - everything fell to her to do if the task needed an adult. Awad was so quick up the tree though! He is very sporting and seems game for any task they gave us. 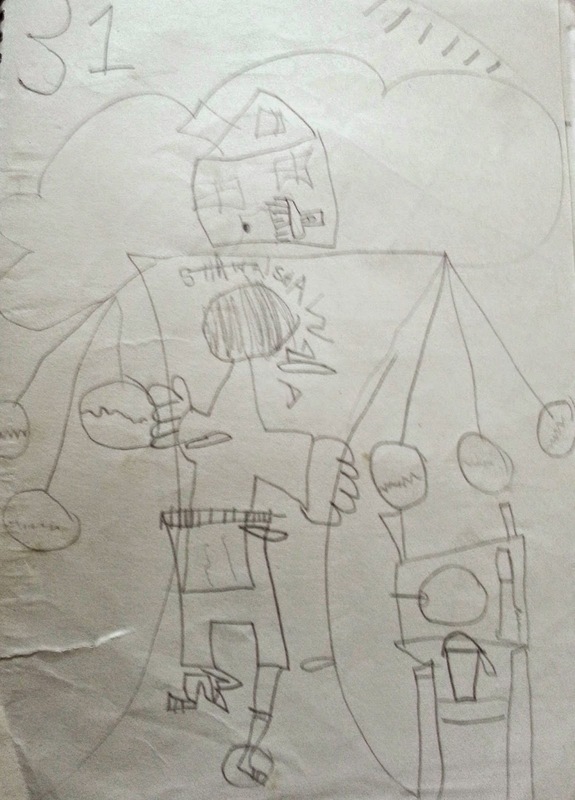 Shawna's illustration of herself climbing the coconut tree! The hanging circles are coconuts. She has grooves in the tree for climbing, and you can only see the back of her head because she is facing the tree! A chair on the side with a cup full of coconut juice and meat. See the real picture of this below! Cutting open the coconut - Here's another prime example of something Farzana just had to take upon herself to do as she is the only adult. Even while she was at it, she was telling her girls to stand further as she was afraid the parang would fly off and hit them. But still, she gritted her teeth and got on with it. I was keen to chop the coconut as it seemed like a fun thing to do. But I was also terrified of accidentally chopping my fingers or hand off! Matthew was supportive and let me try, even though my first attempt at it was a horrendous one! By the time Matthew tried to chop the coconut, it was too late and we ran out of time. To make things worse, I had apparently chosen a leaking coconut - so most of the juice had leaked out onto the sand while I was hacking away at it. Sigh, what luck! Oh! Managed to find the ad below, that actually had some footage of me successfully cutting open some coconuts such that I could actually (finally!) pour the coconut water out! 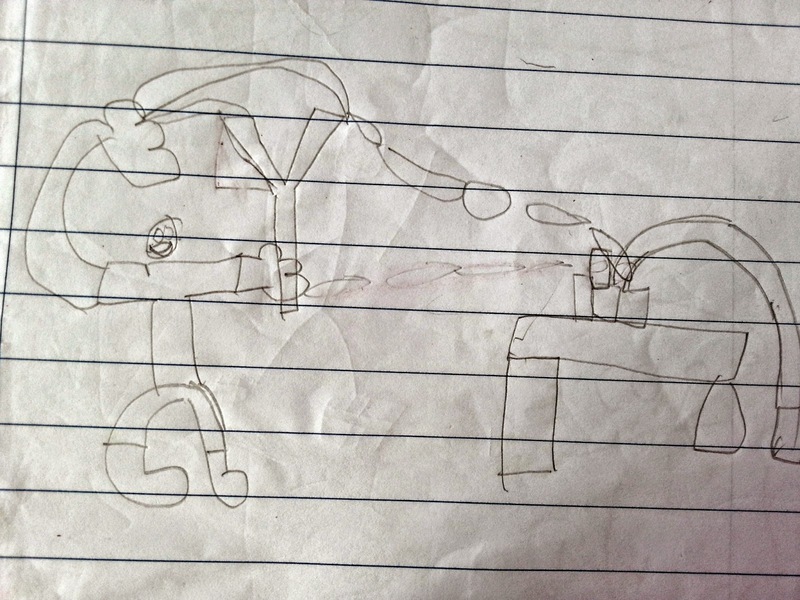 Asher's drawing of his favourite activity so far - playing with the slingshot! Isaac starting to like the kampong - As you can see, Isaac is starting to come around. Maybe he got used to it. Or perhaps it was because he had a good day. 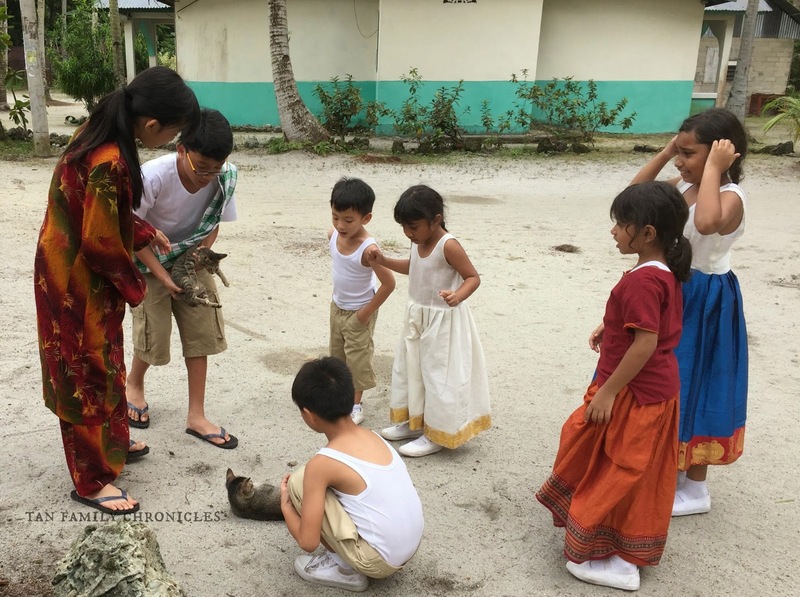 Chasing chickens was fun, coconut challenge was exciting and playing the kampong games was a novelty that has yet to wear off. In any case, we were really glad he was finally adjusting to life in the kampong. So that's it for this episode. Remember to cast your votes through the ToggleNow (not Toggle) app, within 48 hours after the episode airs on Channel 5 - Sundays, 9.30pm :) Throwback: Balik Kampong! 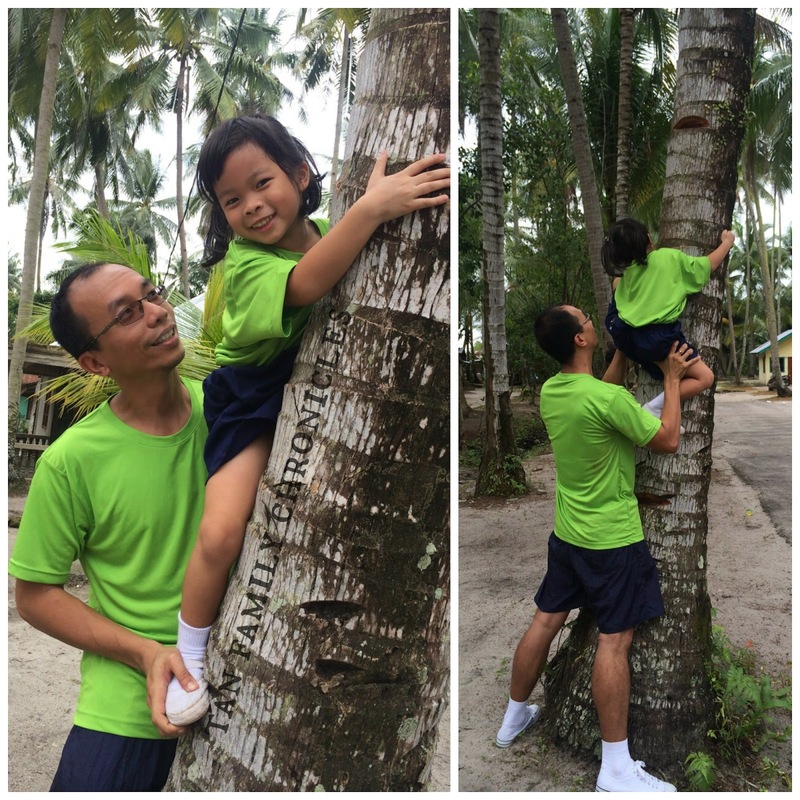 Shawna attempts to climb the coconut tree! Photos courtesy of Rozz! Thanks Rozz! Enjoyed reading this post! And that shot of you grabbing the chicken that was on top of the fence, almost gaining freedom - wow!! Heroine! hahahaha thanks L Lee ! Was such luck that I managed to grab hold of that chicken before it flew off the fence to freedom!